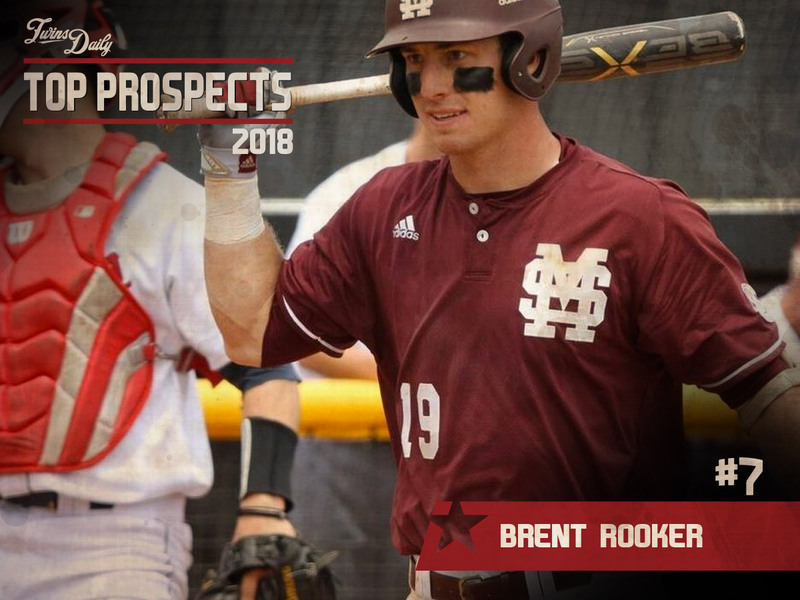 The Twins drafted Brent Rooker in the 38th round of the 2016 draft following this third year at Mississippi State. He chose to go back to school for another year. It was a great decision. He his .397/.495/.810 (1.305) with 30 doubles, 23 home runs and 82 RBI. He won the SEC’s Triple Crown, the first to do that since Rafael Palmiero over 30 years earlier. Following the season, the Twins made him the 35th overall pick in the 2017 draft and signed him to a $1,935,300 signing bonus. Brent Rooker bet on himself and it paid off. The Twins are betting that his advanced bat can quickly contribute at the big league level. That could happen as soon as later in the 2018 season. As Twins scouting director Sean Johnson told Fox Sports North after the draft, “We like his power potential, obviously… We thought he had one of the best bats left on the board, and we’re glad we got him. After that historic SEC season, the Twins sent Rooker to Elizabethton for about a month just to get back into the baseball-playing groove. It didn’t take long. In 22 games in the Appy League, he hit .282/.364/.588 (.952) with five doubles and seven home runs. As promised, he was quickly promoted to Ft. Myers. Again, it didn’t take him long to adjust to the league. In 40 games with the Miracle, he hit .280/.364/.552 (.917) with six doubles and 11 home runs. The 11 home runs were one more than Todd Walker hit in 46 games for the Miracle during his draft season of 1994. His 18 combined home runs was the most by a Twins minor leaguer in his draft season since Paul Russo hit 22 for Elizabethton in 1990. Not only does he have power, but he’s also got a great approach and is willing to take his walks. With Elizabethton, he walked in 11.1% of his plate appearances. After moving up to Ft. Myers, he still walked 9.9% of the time. While Rooker is a guy who could fly through the minor leagues because of his bat, that doesn’t mean he’s a finished product. There are some question marks. Offensively, he’ll likely have to make some strides in terms of contact. In his 162 plate appearances, he struck out 29.0% of the time. That percentage is fine when providing the kind of power that Rooker is capable of, but it’s something that should be watched as he continues to move up that ladder. Defensively, he played in the corner outfield spots at Mississippi State as a sophomore, and then spent time at first base. Defense isn’t going to be his strong suit, but he can provide adequate defense at both spots. He’ll continue to work to improve at both spots to be able to be ready when he’s needed. Considering he was just drafted last June, it’s strange to think that he could appear in a big league uniform in 2018. He’s played just 40 games in Ft. Myers, so it’s possible that he could start the season in the Florida State League. But don’t be surprised if he is in Chattanooga early in the season. And, once a player finds success at AA, it’s about opportunity. If not in 2018, he is a candidate to be in the big leagues early in 2019. The Twins struggled against left-handed pitching at times in 2017. Throughout the offseason, we have heard that the Twins needed a right-handed power bat. While it won’t likely be in the first half of 2018, at some point in the near future, Rooker will be able to help fill that void. At some point in the not-too-distant future, Rooker could join the likes of Miguel Sano and Byron Buxton as right-handed power bats. Get to know more about Brent Rooker and much more in the 2018 Minnesota Twins Prospect Handbook. I love his approach and his talent - put him at 1B, DH, get him in the bigs this season.Tony Oliva started hitting in the bigs at 23, Griffey at 19.Give this bat a chance. Excited about this kid! Hope he finds the groove early in 2018! I was hoping his middle name was James, or Jason, or maybe Jermaine, so I could call him "B.J. Rooker." As it turns out, his middle name is...BRENT! First name Terry. Not sure how Gardy would've nicknamified Rooker; Rooky would work for the first year, but after that, it would just be mean. THIS is the guy that I think surprises this year! If Kepler gets traded, I wouldn't be surprised to see him up after the All Star game; can't imagine Granite would really be holding his own by then. And what team couldn't use a Sano-type boost to their line up down the stretch?! Hell, maybe Mauer's production falls off a cliff and they insert Rook (nickname??) Into the lineup and don't trade Kepler afterall. I will DEFINITELY be grabbing tickets to see him play the Southern League Circuit this year (my sales territory includes Tennessee, Alabama, and Mississippi). Here we go boys! Baseball season is 2 days away! I know he's young, at least experience wise, but damn he looks like a natural hitter! I could see Ft Myers to begin the season, (get in a groove, etc), but the Twins are heavier in pitching talent in AA and AAA than positional talent. There is real opportunity for him to begin at AA, or get there soon. I know we have a new FO, but the Twins have NEVER been shy about promoting from AA if they thought someone had the "it" factor. Anybody got some minor league footage of Rooker? It'd be fun to see. I don’t mean to throw cold water on the hype but Walker and Palka had similar (slightly better?) strikeout rates at A+. If he can bring that down to ~25% as he advances to double and triple A I’ll be more excited. Otherwise, we can probably anticipate the MLB strikeout rate being in the high 30s, which will be problematic. Rooker also posted an OBP of .364, vs. .307 for Walker. Palka played A-ball in the CAL league, which is a notorious hitters league. FSL is a notorious pitchers league. Rooker still posted a better OPS. My fun fact last year when Rooker was in the FSL, is his HR-rate was basically identical to Sano's there. Don't get me wrong, this is a fine idea to pour some water on hype, but those two were never the level of prospect Rooker is either, and for good reason. I think he's going to hit and will still post strong OBP numbers even if K's are there. He's a different animal in his approach and I love that about him. I agree.It's easy to amplify the positives and muffle the negatives, especially this time of year.But, Rooker has way better plate discipline (especially compared to Walker), even though it's a small sample size.That almost .500 OBP in the SEC his senior year does give reason to believe it's his game though. Seth (6), Nick (8), Cody (4), Tom 6). Wow, that 2017 draft has the potential to be pretty outstanding. Hard not to like Rooker at this point, and it would be great if he's able to move aggressively through the system. I'd like to see him cut down the K's too; I get that it's considered acceptable with his power production, but it'd be nice for someone with his apparent batting eye to make a little more contact too. I think he probably starts the year in Ft. Myers and moves up quickly. How he responds to facing AA pitching is going to say a lot, and whether or not he can start handling the really explosive breaking stuff along with guys who are starting to learn how to pitch, not just dominate through sheer stuff. I loved this pick when we made it, and the early returns are right where you'd hope they'd be. Kyle Schwarber hit every bit as good as Rooker at A+, and he managed a 20% K% instead of Rooker's 30%. Schwarber's career MLB K% 30%. Alex Bregman had a sub-10% K% in his first taste of A+ after being drafted, and he made it up to the MLB the next season... and he had a 24% K%. Michael Conforto had a sub-20% K% in the minors before being called up. Andrew Benintendi crushed the minors, finishing with more walks than strikeouts when getting called up. I'm sure there are others, but I just don't see enough bat control with Rooker to have any confidence that he will be a fast mover. I think the Twins can afford to be aggressive with Rooker - I'd like to see him start in AA. But I have zero expectations that he will be an impact hitter in the big-league lineup by the end of 2018 - as a bat-only player he will need to be very good (think 120 wRC+) right off the bat to merit a spot at DH/1B on a competitive team. His strike outs are a concern but he does draw some walks. We also have to accept that the game is changing and strike outs are that big of problem anymore. We're probably not going to see to many modest strike out sluggers anymore. Benintendi of the Red Sox was a Sept call-up in his second year with the sox.Also, a MVP in the SEC.I look for Rooker to be the 1B-DH next year. I disagree with one comment, Seth.And that's about his moving up the ladder.You see I want to see him take another step in April and then jump off that bloody ladder. Who was that kid that the Cubs drafted real high a few years ago and jumped right to the majors a few weeks into his second season?Rooker had to have as good of numbers as he did in college.Why can't it happen for the Twins? What surprised me when reading your post was that he hit over .280 average with a lot of walks.That's a lot more than just home runs.Get him up here in May as the full time DH along with backing up Mauer on his days off. That #1 in the title of this thread looks a little crooked, it could almost be viewed as a #7. Want me to edit that for you Seth? I thought he was talking about Kyle Schwarber who can't play any position. Rooker's going to play RF or 1B, it's not like either are demanding positions. His ascension would/should have no relation to his defense. Hey Bob, Thanks for all you do.First hand info from Ft. Myers is appreciated. Milles gratis, Mr. Bob. Good form on the swing, but he looks pretty tight. When Rooker loosens up and gets some rhythm, he could uncork some long shots.